I admit to being hard-pressed to name more than a few writers from Singapore, the city-state of 5 million people in southeast Asia that some might characterize as an economic and multicultural beacon and as a nanny-state cautionary tale. Singapore's history as a colony dates back to 1819, and its independence came in two stages, first from Great Britain in 1963, and then, after a two-year merger with Malaysia, again in 1965, and it has produced a number of writers of skill and significance in each of its four official languages, English, Malay, Chinese, and Tamil, as well as in its unofficial ones. Fortunately, though, one immediately comes to mind: Edwin Thumboo (1933-), who is one of its pioneering English-language poets, and the putative, though unofficial, Anglophone poet laureate. Thumboo was a professor, department chair, dean and director of the Centre for the Arts at the National University of Singapore for nearly four decades, his research and teaching interests ranging widely, though one of his most important efforts was to introduce Commonwealth/New Literatures, which is to say, Anglophone literatures from across the globe, into the university curriculum. Amidst this vital institutional and field-building work, Thumboo published five volumes of poetry, as well as anthologies of Singaporean and Malaysian Anglophone literature, essays and critical works, and other books, such as his 2005 edited collection of tributes to the Filipino novelist and poet Francisco Sionil José. Although he's probably best known for his poems with nationalist themes, which helped to craft a multicultural, post-independence vision of Singapore, he also has written lyric poems like the one below that ruminate on language itself, asserting that human control, through literature, animates words, though I would counter that we increasingly know that they possess powers of their own. The language game is not just ours to play, or rather, we the rules aren't always in our hands, despite what we think. Nevertheless, in light of the new, emerging, polyglot society in which Thumboo is writing, the aesthetic and cultural work of art can and does create meaning: that is the essence of Thumboo's career, and of poets like him all over the world. 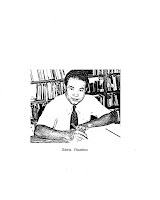 In case you want to learn a bit more about Edwin Thumboo, here is a 2005 interview from the Quarterly Literary Review Singapore that Felix Cheong conducted with Thumboo. And here is Manote Tripathi's very recent writeup of Thumboo in Thailand's The Nation. WORDS Words are dangerous, especially The simple kind you leave behind for others, For undesirable relatives and assorted purposes. They are understood simply, edited, Taken with a kind of air, a careful disregard: Their plainness complicates. When you say Tell him please That the anger has come to pass That friendship is not maimed...or Please do come but after the Fever has been put aside... When you mean to be polite, Careful, explicit, considerate, circumspect, Adopting the proper tone, You are likely to be quoted as saying He won't... Words are neither valid, merciful nor bad, In themselves, nothing unless used, urged, Imported into dialogue, Becoming part-anger, part-laughter, bruised, Adding to the mood and gesture. Words are words. Except for us They are not personalities. We make them into poems. Copyright © Edwin Thumboo, "Words," from Gods Can Die, Singapore: Heinemann Educational Books (Asia) Ltd., 1977. All rights reserved. Edwin Thumboo[i] is arguably the most famous and powerful figure in Singaporean literature. He is also the most controversial, generating a broad range of responses to the meaning and value of his verse. Thumboo’s poetry parallels not just the stages of his life but problematically also how Singapore has developed socio-politically. These inextricable aspects create the very possibility for conflicting readings, which essentially disagree over historical decisions, the role of art and the impact of Thumboo’s career and character. My essay will look at the construction of the image of Thumboo and its relation to these differing outlooks. I shall consider the dimensions of his historical place, his artistic convictions, his status in literary and academic culture and his own personality. A different way of working with Thumboo–without using him to frame Singaporean literature–is also proposed. My wish is to be able to confront objectively where this major poet’s legacy stands today. Edwin Thumboo turns eighty in what is also the sixth decade of his poetry. The span of his career makes it more possible now than ever before to speak objectively about the man and his body of contributions. A huge amount of primary and secondary material on this celebrated writer-critic is already available at our disposal. Among the newer resources for researchers is my own annotated guide that has been housed at the National Library of Singapore’s website since 2011 and updated from time to time. [ii] This bibliography on Thumboo–the most exhaustive one to date–contains several hundred entries from across over half a century that involve the poet in his various capacities. Mentions of Thumboo are fascinating because they are not just tied to literary discussions on the English canon, postcolonial, emergent and diasporic writing and Singaporean, Southeast Asian, Commonwealth, world and comparative literature. They also appear in other academic fields such as linguistics, political science, sociology, geography, architecture and cultural, migrant, urban, Singapore and international studies. Then there are the records of his institutional work, the journalistic reports on his travels and social engagements and the articles on any of the aforementioned areas in other global languages. The absolute historiographer may be thrilled to find numerous early drafts, manuscripts and paraphernalia belonging to Thumboo in the National Library. Even as documents from a less organised past and different parts of the world are still being discovered and catalogued, one fact now stands beyond dispute. Thumboo is the most widely cited Singaporean writer and remains–at this point in time–unparalleled in his reach across cultural and intellectual communities. Yet, it must also be admitted that he is fast becoming unfamiliar to younger domestic readers who may nonetheless be acquainted with the poets of the last two decades. The conflicting trends would be odd in the context of another writer, but Thumboo derives much critical importance precisely from his ability to generate paradoxes. The aim of my essay here is to pay tribute to this poet’s life and career by means of the various contesting forces of perception that serve to designate his place of influence. This discussion should, in fact, also shed light on some more noteworthy puzzles about Thumboo’s status. For example, while others may have written earlier or written more, exploring a wider range of themes, styles, genres and perspectives, it is Thumboo who is known universally as the father of Singaporean literature. [iii] Singapore may still lack a strong dialogue across its different literary traditions, yet Thumboo sits comfortably as the champion of writing in not just English but all of its official languages. His poems are controversial, dividing poets as fiercely as they do critics–and, for this reason, he is deemed as the touchstone for understanding an entire written culture. The centrality is unassailable: no commentator on Singapore’s literary scene can be considered well-informed without having demonstrated a legitimate opinion on his verse. All these factors make it wholly inadequate to celebrate Thumboo’s legacy for its impact only and not its intrigue as well. It is also a serious mistake to use him not just to initiate thoughts on Singaporean literature but essentially to frame them. Yet, Thumboo has become the notorious first and last word on the field, being practically synonymous with it for some observers. The approach overlooks the dynamics and complexity of multilingual Singaporean writing and at once clashes with the project of expanding “new writing” as a terrain that Thumboo actually supports. Essay after essay, volume upon volume, critics circle an all-too-predictable choice of his poems and seem reluctant to deviate from typical connections to state made with his so-called public poems. Many tend to resist the full breath of his oeuvre even though, by exploring it, they may be able to look anew at Singaporean literature itself. If one needs a good grip on Thumboo’s verse, critic Rajeev S. Patke has listed all the “mere outer facts”: “Thumboo’s output is on the slim side; it is interspersed by gaps; it parallels the birth and growth of Singapore” (188-89). Patke further sums up its poetic value as that “of a humane humanist, whose intuitions about language are always at the service of that in being human which gives wisdom and gladness, never unleavened by pain and loss” (189). Such succinctness goes far to explain why Thumboo’s verse can be absorbed into a dominant interpretation as swiftly and completely as it was. It does not, however, explain why the absorption itself should happen, raising for us another question: what is it that draws culture-makers–specifically academics, educators, civil servants and politicians–to him? There are many dimensions to an answer, and I like to offer only four here. Naturally, the first is the unique historical place Thumboo occupies, writing from Singapore’s late colonial period through its formative era of nation-building. This context presents not just thematic opportunities for creating but also its limits, conditions that compel the writer to discover his or her voice ironically by making neurotic manoeuvres. Fellow pioneer poet Wong Phui Nam recounts how, in Singapore’s process of social harmonisation, the initial youthful ferment of creativity was all but quelled by the “chill winds of the workplace” and a governance that deemed the arts useless to “economic survival and its corollary, the survival of the state” (74). The reality highlights why, their themes aside, Thumboo’s early works, especially through the 1970s, must be recognised as products of struggle, their historical alternative being not so much unencumbered verse as no verse at all. Another famous poem, the anti-colonial “May 1954,” apparently took Thumboo a long time to edit and was included in a collection only twenty-five years later (Thumboo and Gwee, “Life and Times” 61). The delay has led critic David Birch to deduce from the development of his sensibility that it must be “an ex post facto piece of retrojected anger” (167), a reading supported by another literary pioneer, the late Ee Tiang Hong (52). This poem is nonetheless finding new life of late too: it is treated as a central historical document in The Fajar Generation (2010), a volume detailing the first-hand experiences of those arrested for sedition by the British government on May 1954. Meanwhile, it reappears in my own anthology of short socially charged works from Singapore, Man/Born/Free (2011), as a poem whose message still resonates in view of current subtler neo-colonialist trappings both externally and mentally (18-19). The second dimension concerns the flip side of situatedness, Thumboo’s own conscious engagement with socio-political issues and academic trends regarding postcolonial literatures. This writer had steered away from leftist politics very early after his implication in the Fajar affair, being in the editorial team of the University of Malaya’s socialist journal that was charged then. Yet, we can still trace a wary and quarrelsome–albeit respectful–principled dynamics through his public poems, the aim of which is to negotiate for human sensibleness in potentially soul-destroying social engineering projects. His activism continues more openly through his critical focus on postcolonial realities around the world, the emerging English-language literatures of Africa, the Caribbean, South and Southeast Asia and Australasia and the rewriting of English literary knowledge away from its canonical centre. Such preoccupations have tempted critics to make extrapolations and concretise the sense of direct socio-political involvement Thumboo’s verse may conjure. Jini Kim Watson’s The New Asian City (2011)–which purports to examine the creative constructs behind the transformation of built environments in Asia–still subscribes to a tradition that finds his poems performing a “necessary monumentalising”. Watson sees an ideological lock-in where “[t]he process of material development is paralleled in the poetic production of ‘images of power’” (186). Similarly, while studying the merlion as symbol, Philip Hayward observes in Thumboo’s representation the rhetoric of the so-called “Singapore Story”. This is the vision of the ruling People’s Action Party, where Singapore flourishes “due to its respectful roots in custom and history combined with ‘shining’ ‘new visions’ and an ‘urgent’ pursuit of growth, prosperity, and national pride” (“Merlionicity” 116). Patke crucially recovers for Thumboo’s public verse its generic meaning, arguing that it possesses ethical responses specific to historical moments. A public poet simply does not chronicle the way a historian, a journalist or a politician does and must be guided by “the psychic economy of the people” (“The Poetry of Edwin Thumboo” 180). Indeed, as early as in an interview with Goan writer-critic Peter Nazareth in 1977, Thumboo has pointed to his own excursion into socio-politics as “a choice of a poet in a particular setting” and not what he would rather write (Interlogue 159). This idea of choice suggests deliberate self-contracting and redirecting, which also means that any attempt to review the poetry’s inner life cannot just work with its explicit dominant features but should consider having its other traits of note on an equal footing too. The problem with this defence is that it firstly assumes the psychic agreement between the people and the state to be total. If gaps do exist, then the poetic project must be idealistic, naïve or truly servile–a question damned to remain open since original intentions cannot be known. Secondly, as the realms of postcolonial empowerment and state complicity often overlap, we just cannot be sure which is pursued only in the other’s service or whether both are, in fact, embraced. The artistic cost is nonetheless certain since excessive caution and didacticism are always detrimental to poetic honesty and spontaneity. This point is argued well by Wong who warns that the public poet “risks the impairment of his ability to hear the Muse and so the acuity of the inner ear to the Muse’s promptings, and with that impairment, his poetic intensity” (78). Thumboo makes the whole topic more complex as his early voice was already suspicious of what his nation-building self plunged into while the recent Thumboo seems to want to return to the former and, in the process, redeem the latter. We may now raise the whole issue of recuperation as we once did the question of compromise and ask how much choice can be left once particular paths are taken. In A Third Map (1993) and definitely the recent Still Travelling (2008), Thumboo’s most manifest attempt to reclaim his private voice, public markings penetrate his imagination so deeply that one sometimes wonders which way to read them. Consider the poem “Expressing Ubin,” dedicated to the painter-academic Ho Chee Lick, among whose artistic subjects is the islet of Pulau Ubin off Singapore. While admiring this idyllic landscape, Thumboo still cannot resist the public thought and ties the island to Singapore’s early history before glancing backwards at the “City” that has “misplaced / The sea’s quiet” (Still Travelling 49). Such compulsion is not lost even on Patke who observes that, when Thumboo lately draws on his own past or newfound Christian faith to describe “exemplary presences,” we are not far from his perceived duty as “the Muse of History, personal and collective, anticipatory and cautionary” (187-88). The third dimension to the enigmatic Thumboo is the public role he assumes within Singapore’s society and for his country’s reputation abroad. This poet has commanded for decades a strong Virgilian proximity to power on the island that no other Singaporean writer, past or present, is known to enjoy. His influence goes all the way to the top, with ministers as well as senior civil servants and university officials as not just peers but also often friends. The dual artistic responsibility he takes up in this capacity is as the moral anchor for these hierarchs and the apologist of their duties to the common folk. For example, the often cited poem “The Way Ahead” depicts Thumboo as a modest teacher of humanity to professionals who face the task of urban development. “Gods Can Die” has him lament the duplicity of politically influential friends and appeal to their conscience to recover their kinder selves. While these poems also portray the powerful as fallible beings, there are others that demonstrate better the Herculean work that burden and sometimes undo the “great ones”. A good case is a poem whose title plays on the National University of Singapore’s centennial symbol as well as the name of its then president, Shih Choon Fong. “The Shih Salmon” blurs the line between private and occasional poetry, drawing on Thumboo’s fond memories of campus life through the decades to celebrate the new institutional vision of Shih. Shih encounters an upstream challenge that leads Thumboo to assume his day job as academic and reinterpret “Ulysses by the Merlion”. The move itself doubles his ready show of support as he is, in fact, offering up his academic talent as well as his own poetic creation. It is tripled when his Ulysses is further appointed as now an intellectual explorer who must “Strive, seek, find, and never yield”: “So Ulysses still / Strides the seas, contextualising our Merlion” (Still Travelling 62). Thumboo’s curious ability to sense where culture can aid bureaucratic structures and to respond positively is tied to his scope and many years of institutional experiences. While his amphibious career in both academia and the public sector is often noted biographically, the natural impact on his reputation, reception, influence and choices as a poet is admitted less explicitly. Thumboo started work in the late 1950s with the Income Tax Department before moving on to the Central Provident Fund Board and then the Singapore Telephone Board. Nine years later, he turned to lecturing at the University of Singapore and rose through its ranks to become Head of NUS’s Department of English Language and Literature, Dean of its Faculty of Arts and Social Sciences and eventually an Emeritus Professor. Through this time, Thumboo has further established himself as a strong presence in many state-directed cultural committees, programmes and initiatives. He has been a key mover of official multilateral exchanges among Singapore’s various language-based communities as well as the constituent nations of ASEAN. On a broader stage, he is consistently promoted as an ambassador of Singaporean culture as well as a voice of Southeast Asian and Commonwealth literature. At home, for an unbroken stretch of time, he played roles in the formation and evolution of public institutions, from the now- defunct Ministry of Culture to the National Arts Council, the National Book Development Council of Singapore and others. Thumboo as a university official could once influence the teaching of literature in national schools while, through the Creative Arts Programme which he co-ran with the Ministry of Education, he made a difference to the development of generations of young writers. All these placed Thumboo, during his more active years, at the heart of an entire culture machine whose mannerisms and decisions borrowed varyingly from his judgements. The fact can explain general cultural strengths up to the mid-1990s such as the selection and promotion of a small but convincing circle of literary voices across the different language groups. This clarity was able to generate a particular narrative about literary lineage and growth and, with them, a realm of national pride and focus–so long as one did not sense a construct. The weaknesses are, however, more apparent now: for decades, Singapore has produced state-endorsed “high” literature at the expense of popular literature and thus failed to encourage broad readership. Because literature was shielded from “going commercial,” the whole industry of literary publishing stayed in its infancy and neither understood nor was toughened by the challenges and harsh effects of free market forces. My fourth and last dimension can be put simply: it is the complex appeal of Thumboo the person. Reputation in a small and still relatively young literary culture tends to be built as much on a writer’s personality as on his or her body of works. In this respect, Thumboo stands out easily, being warm, candid, disarming to a fault and able to transcend society’s usual divides of culture and class with great finesse. His mixed ancestry–being Indian, Teochew and Peranakan–is a source of not just anxiety but also pride since it renders him over-conscious of his unique perspective from birth. The multiracial–in a point Thumboo asserts about the Eurasians–are immediately multifocal: their “synced identity” makes them the very embodiment of the possibility of trans-racial perspectives (Thumboo and Gwee, “Life and Times” 61). This complex towards people complements Thumboo’s own character and allows him to find associates easily. The abundance of friends means that he can afford to be wise and selective about who he should grow close to. Thumboo’s thoughts on friendship–still among the least studied aspects of his verse–may well involve his lengthiest and most profound meditation. Friendship is perhaps the only force that matters in his poetic universe at large. It extends socially through ideological empathy or shared humane values as an affirmation of the truth of universal brotherhood. On a personal level, it reveals an uncommonly tender and compassionate but also erratic side of him, his honesty being as brutal as his generosity is overwhelming and his vulnerability true. It is thus unsurprising that a longtime friend, the academic and lay minister John Webster, should be instrumental to Thumboo’s conversion to Christianity in the 1990s. This turn to religion is arguably his most significant personal change to date although critic Lily Rose Tope has already found in his earlier verse “a spirit in quest of a meaningful relationship with a power outside himself” (84). In other words, spirituality may have become an overt aspect of Thumboo’s life and art, but it is actually enabled by some affinity that exists in his disposition. Thumboo firstly relates to religion as he does to system: he openly accepts and even guards dogma, perhaps preferring to seek counsel in confidence. His religious poems secondly show an interest in not so much doctrines or experiences of spirituality as Biblical human personalities, another layer of friendship he builds. Tope differently calls it a “theology of feeling,” “an endeavour to understand the divine through the truths about humanity”; the poems are “a study of man and of God through man” (86). For these reasons, the reader who looks for a private man distinct from Thumboo’s public verse may eventually be struck by how indivisible they are. Yet, the parts Thumboo allows to pass into his public character do give an impression of shrewdness, caution and command, expressed through a fiercely independent mind and a boldness and assertiveness in speech tamed only by an intuition of strategy. The poet is a highly persuasive speaker with a talent for quick retort and back-end wit, and he remains sharp and self-aware even in his most casual moments. He impresses with his constantly evolving polymathic knowledge and increasingly speaks as much from his bookish learning and convictions as from his life experiences. The latter itself is modified by special encounters in his career, with his friends, from travel and through his continuous fascination with people types. All these dimensions make Thumboo the exact kind of individual who is best suited to reside at the envisioned core of a national literature. Unfortunately, we will be doomed to questions of causality if we aim to seek out whether the construction of his importance owes most to his historical place, the artistic directions he takes, his orchestration of culture or his own personality. It is nonetheless true that, should Thumboo’s poetry have failed to be explored as widely as it actually allows, the root of the problem lies in a totality of these compelling engagers to treat his controversial themes as his only ones. Perhaps, in a future where sufficient distance and amnesia are gained to achieve freedom from current trends and pressures on thought, we can dissect Thumboo’s poetics more clinically and talk of “Thumboo studies” as a subcategory, rather than the epicentre, of Singaporean literature. Until then, we may try to prepare the ground by raising a question whose answer we ought to know intuitively and yet have not learnt to articulate: how may we apply a term like “Thumbooesque” as a quality of poetry, if not poetic action? I have used this term critically before in reference to the clear distinction between the aims, techniques and structures of poetic productions before and after the mid-1990s. A “Thumbooesque collaboration”–a symbiosis between art and politics–is what I see as having been rejected by the nation’s “new poetry” for “its own centre of orchestrated meaning” (Gwee, “Two Renaissances” 200). In the separate context of a book review, poet Ng Yi-Sheng also points to the opposite end of narcissism in the spectrum of Singaporean writing as an “epic, early Thumboo-esque style of composition” (“Lost in Translation”). The seeming coincidence is meaningful. One can indeed say without being misunderstood that anthologies such as Reflecting on the Merlion (2009), edited by Thumboo and “new poet” Yeow Kai Chai, and Fifty on 50 (2009), which commemorates Singapore’s fiftieth year of self-governance and has Thumboo editing with other-language writers Isa Kamari, Chia Hwee Pheng and K.T.M. Iqbal, are Thumbooesque. This term will become an increasingly vivid implement in the discussion of Singapore’s literature as the field continues to evolve. Up to the 1990s, critics were still only debating over the nature, necessity and consequences of the divide between public and private verse which Thumboo’s work had generated. The arguments tended to range in favour of literature that could be constructive to the national discourse over the “less useful” literature of personal indulgences. What a new generation of thinkers is now able to see is that such a distinction is itself contingent upon historical circumstances and creatively false. No Singapore-born poet–not even an alleged introspective one like the late Arthur Yap or Boey Kim Cheng–is ever defined by a single realm. Yap’s poems such as “there is no future in nostalgia” show satirical reactions to national trends as much as Boey’s travel poems contain means through which criticisms of Singapore are being refracted. Herein lies Thumboo’s key difference from the bulk of Singaporean poets publishing after the mid-1990s. The furthest the newer poets are often willing to go is to promote the growth of an existing or new literary community, many accepting either the social disinterest or powerlessness of verse. This is somewhat revolutionary since it is asserting that state-based society is no longer–or perhaps has never been–able to protect and expand art’s creative resource and actually harms it. Thumboo, however, came from a time when poetry must be mobilised in defence of the possibility of poetry itself: the mental freedom that invigorated the life of poetry had to be kept from the coercion of other cultural forces, including that of state. I say this with full knowledge of the ironic twists of fate; the fact remains that, when poetry once chose to be complicit with power, it did so for the sake of not just a new nation but crucially a new literature. On this note, it is possible to return to counter the familiar charge that Thumboo writes to endorse and vindicate the PAP’s political dominance. This perspective conflates the state’s and the poet’s form of nation-building to make claims similar to this one by Watson: “Thumboo’s voice is almost at one with PAP national rhetoric” (192). It seems convenient that Thumboo himself has admitted that “the propaganda is implicit” in the verse although he asks at the same time for his poetry to persuade more (Nazareth, Interlogue 161). The difference is central as the point here is the space of poetry–and, by extension, culture–for which Thumboo sees as needing to be negotiated socially. If themes and positivity are mere means for poetry to stake its right to place and that is Thumboo’s contribution, then a large part of what reads him cynically is, in fact, blindsided by inflexible present-mindedness. Another sometimes casually made remark calls Thumboo the Lee Kuan Yew of Singaporean literature and offers me a second instance for clarification. At the height of their decades-spanning centrality, both men indeed defined the whole terrain of their engagements. They created possibilities for national self- reliance, grounded communal pride, extended into the very instruments that bolstered their influence, planned rigorously for continuity and still detest divisive racial politics. Yet, this is as far as comparisons go, after which we must acknowledge that differences between Thumboo’s and Singapore’s official vision exist, even multiplying with time. The poet stands more firmly on the side of history, tradition, identity and self-cultivation; he remains deeply suspicious of hegemonic power from an “outside,” especially when economics comes into play. His support of pragmatism in governance has a limit, and this coincides with his rejection of any reasoned act he considers rigid, uncompassionate or humanly catastrophic. There is a further curious aspect of the Thumbooesque that many have yet to come to appreciate well. The word may seem to suggest singularity, but what it actually relies on is collectiveness in a consistent practical way. Thumboo’s verse, even in its religious version, is based mostly on engagements with and memories of people or people types; it addresses, evaluates or pays tribute to them. As significantly, his more obsessive and prolific work lies in anthologising, through which he pulls together poetic as well as critical voices under various justifications for yet another tome. The most ambitious to date–and the purest expression of the Thumbooesque–is the massive ASEAN anthologies of Singaporean writing published in 1985 and 1990, which consolidate works from across the genres in all four main languages. These create a vast artistic social unity that seems to yearn to be real, like the ideal of identity itself. His recent &Words (2010) is the broadest and most abstract in scope, framing Singaporean poems with those from around the world under various concepts and forms. Regular anthology-making in Singapore is a phenomenon that intrigues some critics enough to ask from time to time, as Ronald D. Klein does: “Why another anthology?” To be sure, not all anthologisers on the island can be said to understand the strategic features of this medium–but Thumboo is not one of them. The poet fully recognises that, of all formats, the anthology is most suited for forging a communal identity or at least its possibility to those the project attracts. Like a physical gathering, it is a demonstration of strength, energy and potential as well as a form between chaos and organisation. The anthology is an impatient mode that excites young literary cultures and movements. It leaps into the future in anticipation of final bodies of personal pursuits, of which it is only providing glimpses, or frames for a critical discourse that has yet to find its academic interlocutors. Implicitly, it demands through sheer number a change in the way artistic circles are being perceived. We must realise at length that the Thumbooesque is an overly self-conscious quality that centralises the question of what can make a literature. Through naming or inclusion in his projects, Thumboo is not just populating his poetic universe, strengthening its social memory and empowering artistic voices. His incessant business of framing borders on canon-making in a way that appeals to the anxious psyche of a nation-builder and an academic. Certainly, in spite of its selectivity and often debatable criteria, a literary canon can help to keep at the fore of knowledge truly worthy voices and, in the process, shape social identity. This form of open inscription is also an implicit response to the frailty of public memory, which can prove troublesome in a multicultural context. For example, in the years from the late 1990s when structures began to loosen, we see the dearth of active cross-lingual collaborations paralleling a steady decline in mutual appreciation across the ethnic communities. All that said, we should acknowledge that Thumbooesque activity has generated a few less favourable outcomes too. One of these is the unwitting elevation of English-language writing as the dominant literary field in Singapore ironically through the work of multilingual engagements. The process of centralisation–aided by Thumboo’s own standing–gave English literature a status and representation unreachable to the literatures of Malay, Chinese and Tamil, creating conditions for the very inequality it had sought to stamp out. Similarly ironic is the consequence of academic muscle being used to bring legitimacy to literary appreciation in the country. The move turned academia into the command centre for the planning and directing of literary development and left writers, readers and publishers to play mere supporting roles for decades. The most unfortunate development must be how, at one time, Thumboo’s influence caused a prevalent misunderstanding that message must precede art. It produced a whole genre of fiercely nationalistic bad writing, forgettable works reeking of uncritical optimism or, worse, overt sycophancy–both qualities Thumboo himself is not guilty of. The trend reached its climax by the early 1990s although one may still find traces of it in the occasional institutional creative challenge today. For better or worse, the odium that set in totally transformed the literary landscape, rendering new writers over-conscious about political complicity and the urgency of keeping to a private voice. Thumboo has consequently come to represent a more complex shape, a Freudian father-figure with whose work writers adopt an ambivalent, if not wounded, relationship. Yet, even this schismatic image is now distinct from the person of Thumboo in at least one aspect. I make my final point by comparing two of his interviews I had the privilege to work on, the first being Nazareth’s memorable 1977 session which the chutzpah of youth once led me to edit creatively for Ariels: Departures and Returns (2001). The second is an interview I came full circle to conduct personally in 2010, and an abridgement can be found in Time- Travelling–Edwin Thumboo (2012). Despite both texts having an evidently broad canvas, Thumboo’s dramatic stage has clearly shifted from world politics to his own life, the characters of interest being no longer cultural ideologues but relatives, friends and colleagues. Where the poet used to seem defensive about fixed circumstances while eager to instruct the world, he is now kinder to time’s largeness and passing, seeking to bring shape and texture more to how he and his generation look at issues past and present. [i] A different shorter version of this essay appeared as an editor’s introduction in Gwee Li Sui and Michelle Heng, eds. Time-Travelling–Edwin Thumboo: A Select Annotated Bibliography (Singapore: National Library Board, 2012), 18-23. This volume in the Singapore Literary Heritage series helped to launch a six-month exhibition on Edwin Thumboo at the National Library Building, which ended in March 2013. I want to thank the National Library Board of Singapore for its permission to rework and expand the piece for republication in Asiatic. [ii] Gwee Li Sui, comp. Edwin Thumboo: NLS Resource Guides. Ed. NORA Editorial Team. Web. [iii] In English-language verse, there were Wang Gangwu’s Pulse (1950) and Lim Thean Soo’s Poems (1951-1953), published in 1953, before Thumboo’s Rib of Earth appeared in 1956. Lee Tzu Pheng and certainly much younger poets such as Boey Kim Cheng and Cyril Wong have a broader body of poetic works in terms of both numbers and exploration. [iv] See the range of poems collected in Edwin Thumboo and Yeow Kai Chai, eds. Reflecting on the Merlion: An Anthology of Poems (Singapore: FirstFruits Publications, 2009). Birch, David. “Cunning Beneath the Verbs: Demythologising Singapore English Poetry.” Discharging the Canon: Cross-Cultural Readings in Literature. Ed. Hyland, Peter. Singapore: Singapore University Press, 1986. 147-90. Ee Tiang Hong. Responsibility and Commitment: The Poetry of Edwin Thumboo. Ed. Leong Liew Geok. Singapore: Singapore University Press, 1997. Gwee Li Sui. “Two Renaissances: Singapore’s New Poetry and its Discontents.” Writing Asia: The Literatures in Englishes. Volume 1: From the Inside: Asia-Pacific Literatures in Englishes. Eds. Thumboo, Edwin and Rex Ian Sayson. Singapore: Ethos Books, 2007. 199-213. —, ed. “Interweaving Edwin Thumboo. As Interviewed by Peter Nazareth.” Ariels: Departure and Returns. A Festschrift for Edwin Thumboo. Eds. Tong Chee Kiong, Anne Pakir, Ban Kah Choon and Robbie Goh B.H. Singapore: Oxford University Press, 2001. 152-73. —, ed. Man/Born/Free: Writings on the Human Spirit from Singapore. Singapore: Ethos Books, 2011. —, comp. Edwin Thumboo: National Library Singapore Resource Guides. Ed. NORA Editorial Team. Gwee Li Sui and Michelle Heng, eds. Time-Travelling–Edwin Thumboo: A Select Annotated Bibliography. Singapore: National Library Board, 2012. Hayward, Philip. “Merlionicity: The Twenty-First Century Elaboration of a Singaporean Symbol.” Journal of Marine and Island Cultures 2 (2012): 113-25. Klein, Ronald D. “B-Side Record.” Quarterly Literary Review of Singapore 11.3. (2012). Web. Nazareth, Peter. Interlogue: Studies in Singapore Literature. Volume 7: Edwin Thumboo. Creating a Nation through Poetry. Gen. ed. Kirpal Singh. Singapore: Ethos Books, 2008. Ng Yi-Sheng. “Lost in Translation.” Quarterly Literary Review of Singapore 7.4. (2008). Web. Patke, Rajeev S. “The Poetry of Edwin Thumboo,” Sharing Borders: Studies in Contemporary Singaporean-Malaysian Literature I. Eds. Mohammad A. Quayum and Wong Phui Nam. Singapore: National Library Board and National Arts Council, 2009. 173-89. Poh Soo Kai, Tan Jing Quee and Koh Kay Yew, eds. The Fajar Generation: The University Socialist Club and the Politics of Postwar Malaya and Singapore. Malaysia: Strategic Information and Research Development Centre, 2010. Thumboo, Edwin. Still Travelling. Singapore: Ethos Books, 2008. —, ed. The Poetry of Singapore. Singapore: ASEAN Committee on Culture and Information, 1985. —, ed. The Fiction of Singapore, 2 vols. Singapore: ASEAN Committee on Culture and Information, 1990. —, ed. &Words: Poems Singapore and Beyond. Singapore: Ethos Books, 2010. Thumboo, Edwin, Isa Kamari, Chia Hwee Pheng and K.T.M. Iqbal, eds. Fifty on 50. Singapore: National Arts Council, 2009. Thumboo, Edwin and Yeow Kai Chai, eds. Reflecting on the Merlion: An Anthology of Poems. Singapore: FirstFruits Publications, 2009. Thumboo, Edwin and Gwee Li Sui. “Life and Times: Edwin Thumboo with Gwee Li Sui.” Time-Travelling–Edwin Thumboo: A Select Annotated Biography. Eds. Gwee Li Sui and Michelle Heng. Singapore: National Library Board, 2012. 42-90. Tope, Lily Rose Tope. “The Theology of Feeling: The Biblical Poems of Edwin Thumboo.” Essays on Edwin Thumboo: J. J. Webster, T. Kandiah, Wong Phui Nam and Lily Tope. Ed. Jonathan J. Webster. Singapore: Ethos Books, 2009. 84-98. Watson, Jini Kim. The New Asian City: Three-Dimensional Fictions of Space and Urban Form. Minneapolis: University of Minnesota Press, 2011. Wong Phui Nam. “Nation-Building and the Muse (Reading Edwin Thumboo without Theory).” Essays on Edwin Thumboo: J.J. Webster, T. Kandiah, Wong Phui Nam and Lily Tope. Ed. Webster, Jonathan J. Singapore: Ethos Books, 2009. 71-83.
from Asiatic 7.2. (2013), with thanks to Gwee Li Sui, Mohammad Quayum, and Michelle Heng.